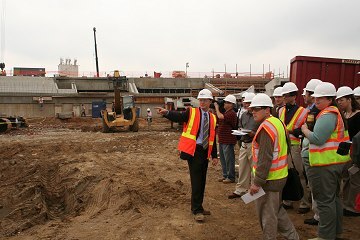 On Oct. 11 the DC Sports and Entertainment Commission and Clark/Hunt/Smoot held a tour for the media to show the stadium's progress. 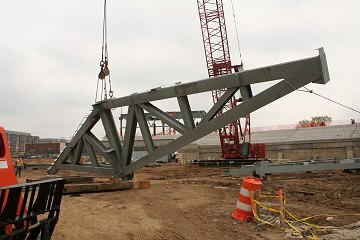 Structural steel had arrived one week earlier, and the stadium was pronounced "on schedule." 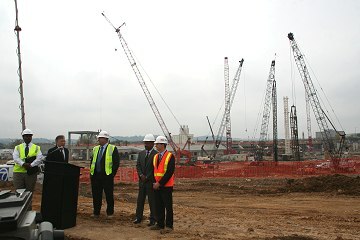 A panorama of the view from the north end of the stadium site. 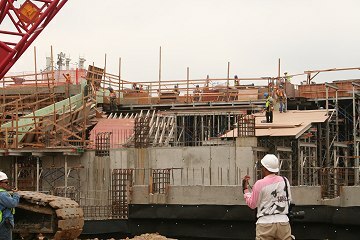 This is the view that most fans will see when they first arrive at the stadium, looking directly into the stadium bowl without having to climb up or down. Principals from the DC Sports and Entertainment Commission, Clark/Hunt/Smoot, and Devrouax & Purnell Architects address the media. 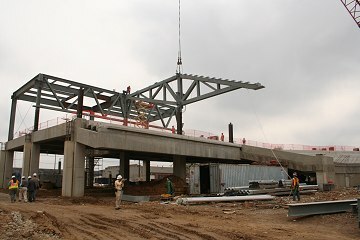 Workers tending to one of the cranes; note the structural steel in place at left rear. 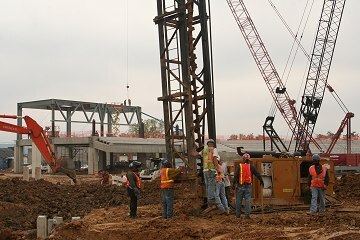 Work continues on the concourse and lower seating bowl. The Clark/Hunt/Smoot tour guide explains it all to the media. 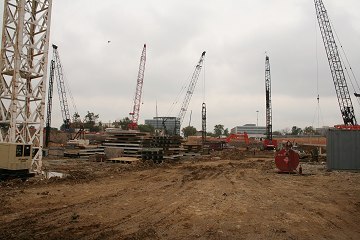 This closeup of the stadium's construction illustrates the clockwise piecemeal method being used--each step in the project begins at 1st and O (far left) and gradually makes it way southward, then westward, then northward, then eastward. So while steel is being placed at 1st and O, pre-cast concrete seating forms are being installed just ahead, and the concrete is being poured just ahead of that; coming all the way around you see the temporary pillars marking where concrete piles have been poured, and eventually the real concrete pillars will arrive, work that was begun at 1st and O weeks ago. 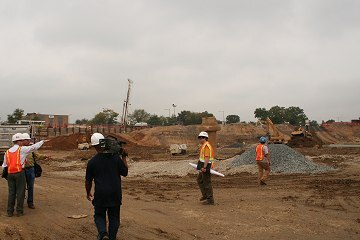 The concrete work is now beginning to head up the 3rd base line. Roughly the same location, eight months later (and quite a few feet deeper!). You can see the beige brick building across South Capitol Street in both photos, to help orient yourself. 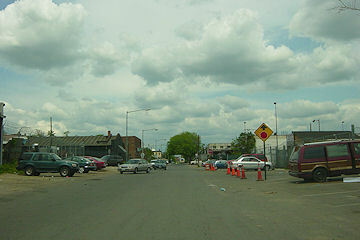 Looking north on Half Street, south of O Street, in May 2003. Roughly the same location, but quite a few feet deeper! 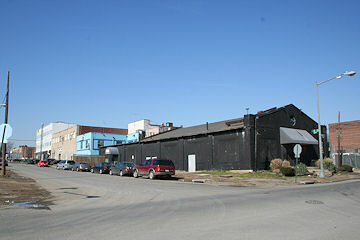 The little yellow "Good and Plenty Market" in the center of the photo is about the only landmark remaining. 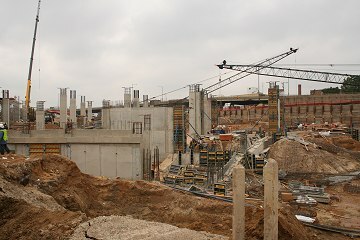 20 M Street is the office building now under construction in the distance. 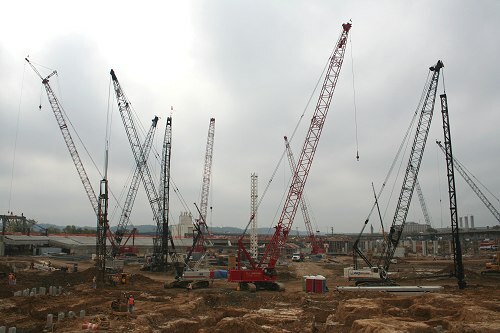 The stadium "crane farm" is multiplying quickly. 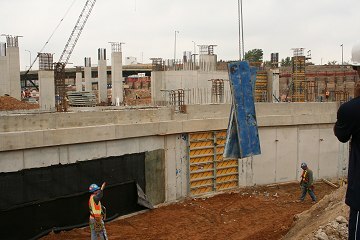 Four minutes of video from within the construction site.